2010 marks the 20 year anniversary of Glamour Magazine's Women of the Year. This year's winners were announced in the November 2010 issue and they are more impressive than ever with leading ladies like Queen Rania, Danatella Versace, and Julie Roberts among the honorees. 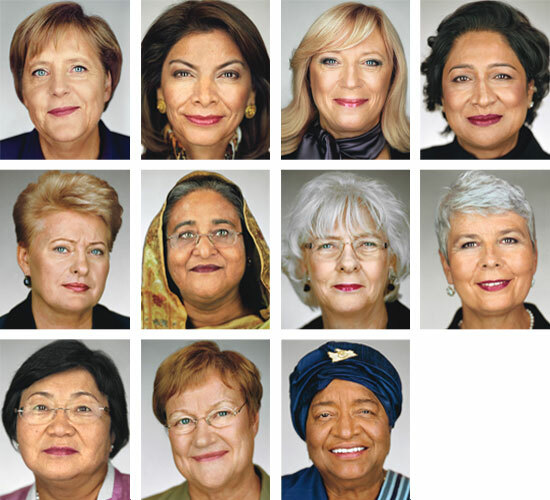 Our World's Female Heads of State (pictured above) were also called out and they are indeed an impressive group: Top Row, from left: Chancellor Angela Merkel, Germany; President Laura Chinchilla, Costa Rica; Prime Minister Iveta Radičová, Slovakia; Prime Minister Kamla Persad-Bissessar, Trinidad and Tobago. Middle Row, from left: President Dalia Grybauskaitė, Lithuania; Prime Minister Sheikh Hasina, Bangladesh; Prime Minister Jóhanna Sigurðardóttir, Iceland; Prime Minister Jadranka Kosor, Croatia. Bottom Row, from left: President Roza Otunbayeva, Kyrgyzstan; President Tarja Halonen, Finland; President Ellen Johnson Sirleaf, Liberia. Not pictured: President Cristina Fernández de Kirchner, Argentina; Prime Minister Mari Johanna Kiviniemi, Finland; President Borjana Krišto, Bosnia and Herzegovina; President Doris Leuthard, Switzerland; President Pratibha Patil, India; Prime Minister Julia Gillard, Australia; President Mary McAleese, Ireland.